Decide you can do it! Create your own Pennies in Protest and turn hatred into kindness! Step 1: Decide that you can do it! This effort can be as big or as little as you want it to be. This website provides instructions for a fairly substantial effort, but you don’t have to do all of the steps. If you want to do something small with your neighbors or family or playgroup or office, you can do that too. 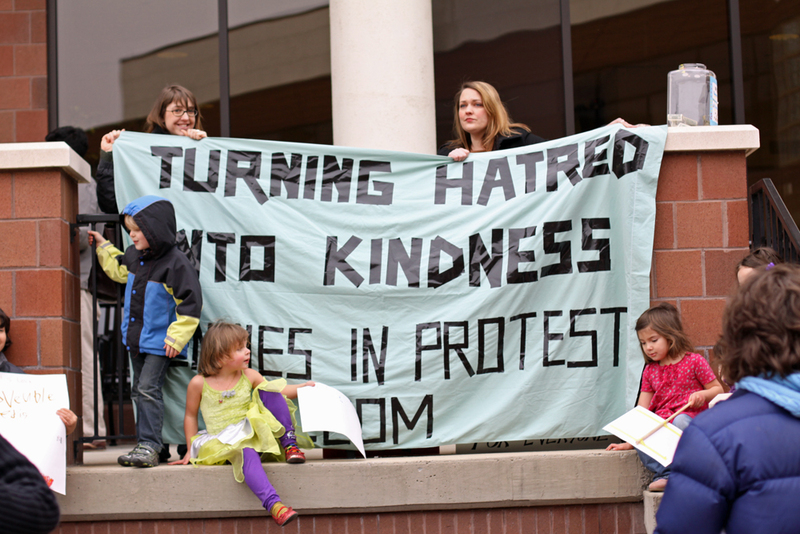 The idea is to transform the negative energy brought by a hate group with love, support, and kindness. You can do that on a big or small scale. If you want to do it on a small scale, decorate a shoe box and start collecting money. If you want to do it on a bigger scale, keep reading! a) Collaborate, like we did. There are advantages and disadvantages to doing it with other people. Advantages: Each of us had very different strengths, and we can’t imagine even one of us not participating, because each of us brought something unique to the experience. Also, it turned out to be much more emotionally intense than any of us were prepared for, and it was lovely to have a group of friends who trusted each other to process feelings and situations that came up. Finally, from a very practical standpoint, the more people involved, the less work each person has to do by his or herself. We were amazed at how this snowballed and how many things went undone in our own homes when we were doing this. It’s hard to imagine not sharing the work load. Disadvantages: managing feelings, priorities, and schedules can be hard. And you won’t get your way on everything! b) Go it Alone. You can easily get this started as an individual. Once we got started, people came out of the woodwork offering to help with logistics, so you can always recruit help in specific areas as you need it. Advantages: things can go exactly according to your vision for the effort. Disadvantage: a lot of work and a lot of loneliness when things get intense. c) Partner with a local nonprofit. A third option is to partner with a group who is being targeted by the WBC or with a local organization that benefits people being targeted by the WBC. Advantages: you can use their bank account as a fundraising repository and skip over all the messy implications for your personal taxes. You can use their network and resources to spread the word. You can share the work load with them. Disadvantages: Part of our success was that we weren’t officially linked to any one group. People who may not have supported all of the groups we raised money for gave to us anyway. Our dissociation from the targeted groups gave our cause more universal appeal. We decided to split all the money we raised in equal parts between the four organizations that were being targeted by the WBC here the Virginia Holocaust museum, The Weinstein Jewish Community Center, a Jewish day camp and educational organization called the Jerusalem Connection, and the Straight-Gay Student Alliance at Hermitage High School. 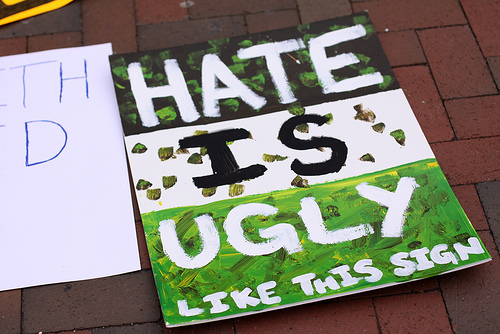 Some argued that we should have chosen one or two umbrella organizations to get all the money, but the idea that the WBC visits resulted in direct kindness and goodness for the specific organizations they choose to protest really appealed to us. It made it feel more like an effort that was transforming hatred into kindness rather than just combating hatred with kindness. We raised so much more money than we planned that the Straight-Gay Student Alliance didn’t have use for all of it and asked us to donate money in their name to other local LGBT charities, including ROSMY (the Richmond Organization for Sexual Minority Youth) and the Gay Community Center of Richmond. Our Facebook page served as a great hub for the community to rally around this effort. Social media reaches lots of people very quickly, so it’s no wonder it was a big key to our success. We set up a fanpage on facebook, and asked the people in our networks to join. They were passionate about joining the cause, so they passed it on to all the people their network, and so on, and so on. This form of viral marketing worked better than we could have imagined. By the end of the week, over 3000 people had joined our Facebook fanpage. We used ChipIn.com. Others are etransfer.com and QGiv.com, which we can’t recommend because we didn’t use them. Meanwhile, there is a ChipIn widget that is updating your totals. Keep in mind, it isn’t real time and isn’t always accurate. Every time someone makes a donation to your Paypal account through ChipIn, you get an e-mail notification. ChipIn also has some minimal reporting functionality that shows you how much money is coming in. Other donation options: Some people may not feel comfortable donating directly to you, so we provided a list of local organizations that would accept direct donations (link to list we provided). We asked people to let us know if they made a direct donation so that we could keep track. In the end, we accounted for nearly $14,000, but only $11,246 was given directly to the ChipIn account. We also collected $520 in cash, and we were notified of more than $1800 in donations made directly to local organizations. Get someone to donate $20, $50, $100 just to get the account going. No one wants to be the first to donate to an unknown entity. People will feel more comfortable donating online if it’s clear that other people already have. We wrote a template email and encouraged our friends and family to share it with their networks. Feel free to copy or use whatever is useful. Send the email to everyone on your personal email list, and ask them to forward it. Provide a copy of the email on your Facebook page, blog, and anywhere else people might look for it. The easier you make it for people to spread the word, the more likely they are to do it. We estimate that email communications spread to people who don’t use social networking were responsible for about 20% of our donations, so it’s a critical piece of the plan. Feel free to customize the press release we wrote for your city or start from scratch. You can easily skip this step, but it gives your effort a great deal of legitimacy if you do a press release. Once you have the release written, post it on your Facebook page, blog, ChipIn page, etc. But don’t send out the press release to the media until you have some decent activity. The media won’t think it’s a story until it seems like it’s taking off. Facebook and Twitter are ideal for spreading the word and at least half (if not more) of our donations came in from people who heard about the effort on Facebook or Twitter. Facebook: Send a message to everyone you know asking them to become a fan on Facebook. 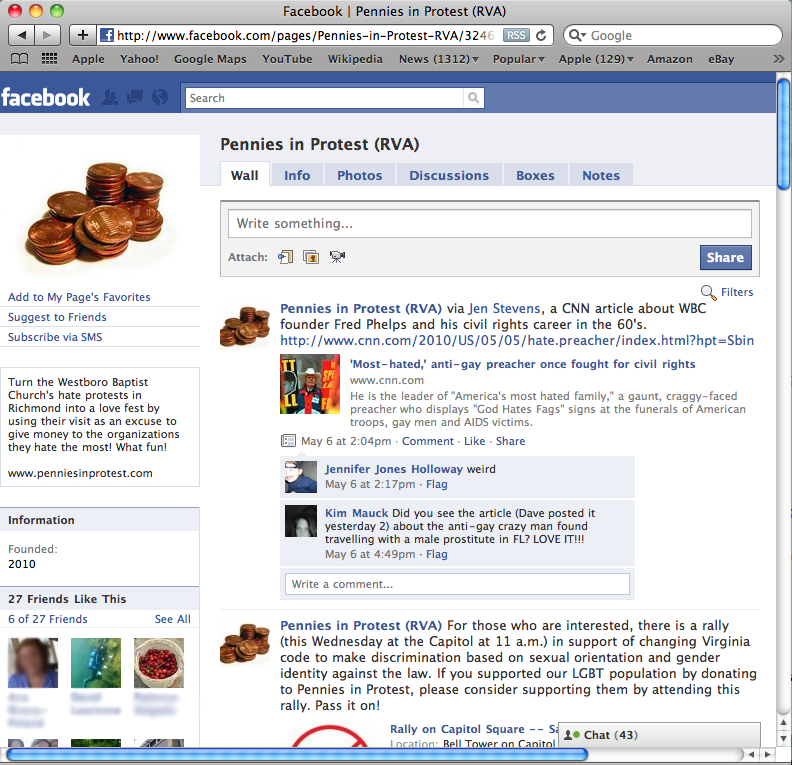 Write Facebook status updates for your Pennies in Protest page at least 3-4 times a day but no more than 10 times a day. This will keep you top of mind for people without annoying them. Update on how much money you’ve raised, how many fans you have, etc. Check out our archived Facebook page for examples of how we did it. Twitter: If you don’t already have a Twitter account, you can sign up for one. Better yet, draft someone you know who does have one and ask them to use it to help you. Make sure you use your city code on every tweet. For example, ours is #RVA. By adding #RVA to every tweet, we made sure that people who were interested in #RVA news would see our tweets, whether or not they followed us. Check out our tweeting history for an idea of what to say. Blogs: If you still have any time and energy left, find a list of blogs that are local to your city and go through them one by one, emailing each blogger with a standard email asking them to write about your effort. You can do as much or as little of this as time allows. You can use a modified version of your press release to send to bloggers in your area. Other social networks: If you are on message boards, listserves, or other social networks, use them to spread the word. Keep messages short and concise and link to your Facebook page or blog so people can get more information if they want it. Don’t be afraid to shamelessly ask people to forward, retweet, repost, etc. Try to find the balance between staying top of mind and annoying people. 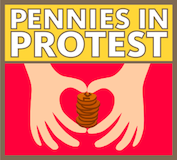 At one point, one of our friends said “enough about Pennies in Protest already! You guys are everywhere! I’m sick of hearing about it!” It’s okay for that to happen for a couple of days, but better if it’s the result of organic word of mouth than because you were personally bombarding. Getting in touch with the media is easy. Just go to their website and find an email or phone number for their editorial department. If you end up calling, just ask which reporter would be most interested in a story about a local effort to raise money for targets of the upcoming Westboro Baptist Church protest. And let them know you already have a press release to send. TIP: for television stations, give them something interesting to film. Offer to have someone come to the station for an interview or invite them to watch you making posters with your kids in the back yard (that’s what we did). Offer to bring piles and piles of pennies to the studio to make an interesting visual. Many other counter-protests were planned in our community, and after much discussion and debate, we decided we would join them as individuals but not as “Pennies in Protest”. 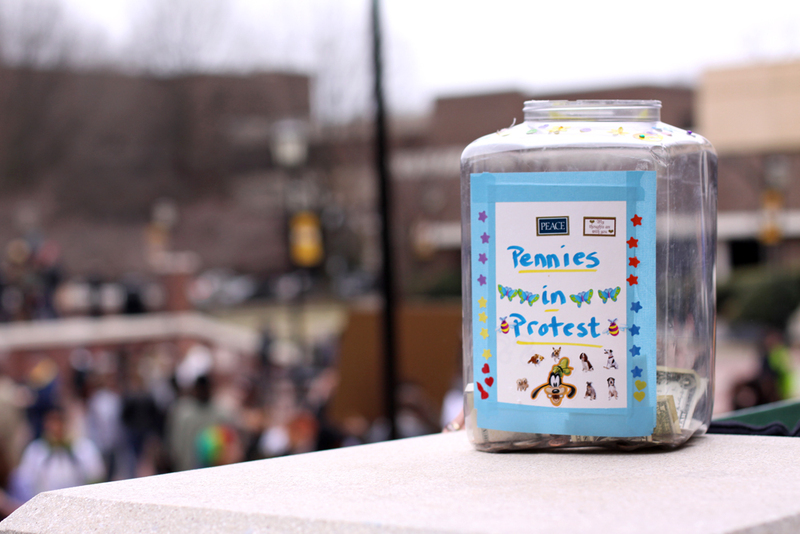 We did, however, make a collection jar with a sign that said Pennies In Protest and collected peoples’ loose change at the four local protests. We collected over $300 in cash at the protests. At some of the protests (like the one at the Holocaust museum, which felt very solemn), it felt tacky and exploitative to collect money, even though it was for a good cause. At other protests, it was perfectly appropriate and successful. It is also perfectly legitimate to decide that your action is to collect money for the targeted organizations and that you won’t be taking part in the in-person protests in any way. Whatever you decide, it should be an intentional, thoughtful decision. Visit our special considerations page for information on children and protests. It’s important that you do this quickly and efficiently to encourage trust and faith in your effort. It’s really fun to take the money in person and see the love and kindness created by your effort, but some people prefer to distance themselves from the gratitude by mailing checks. Make sure you get a receipt and encourage the recipients of the funds to thank the community publicly, by posting on your Facebook page or blog. Set a time limit of 2-3 weeks out and aim to have all the money distributed by then. Have all documentation at the ready in case anyone questions where the money went. We are still figuring out the tax implications of having this much money in and out of personal checking accounts. If you know an accountant or tax attorney, it’s worth looking into. Step 13: Write a thank you note! It was important to us to let the Westboro Baptist Church know that the organizations they hate the most benefitted directly from their visit to our city. 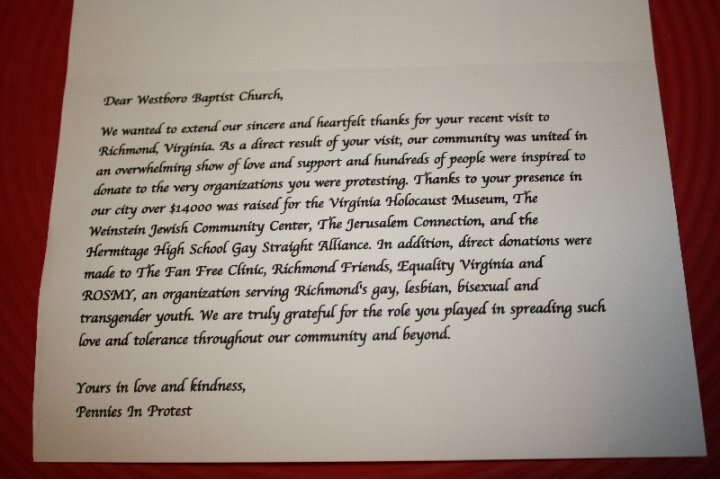 If they had never come here and chanted their hateful messages, our local community wouldn’t have donated $14,000 to local Jewish and LGBT organizations. They came here to harm our local Jewish and LGBT people, and their visit resulted in love and support. 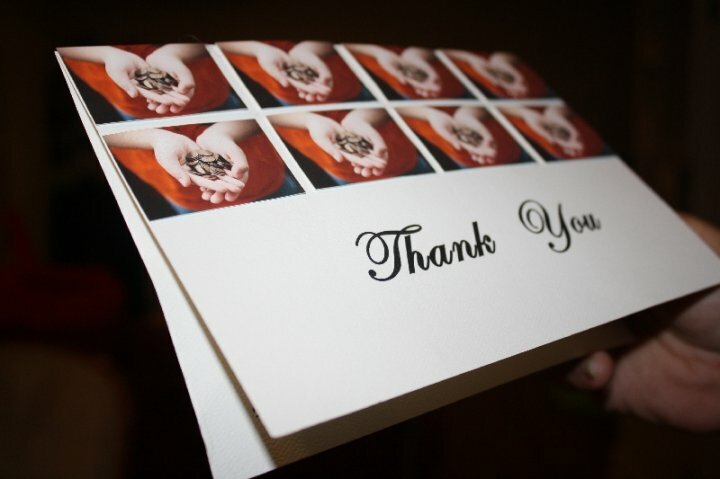 So we made them a beautiful thank you note, and we mailed it to them. Look at the Westboro Baptist Church’s website and see who they’re visiting next. Email the organizations on their list or any friends you have in that city, tell them what you did, and send them to this website so they can do it themselves.